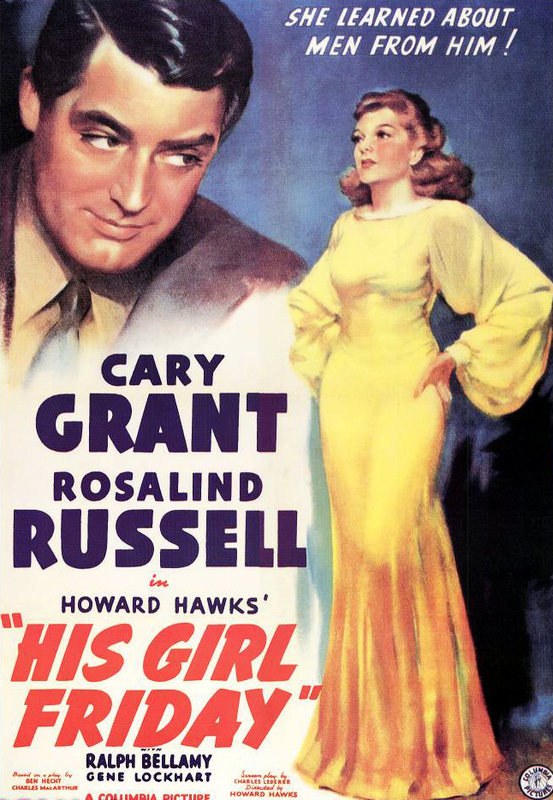 When I was putting together the list that ended up being The ABCs of Movie Masochism, the film I was most looking forward to watching was Howard Hawks' His Girl Friday. I've never actually seen it before, which is probably inexcusable to most of you. It is to me too: while it may surprise all that don't know the Cap'n very well, I have a soft spot for screwball comedies. They're the only types of romantic comedies I consistently enjoy, I'm guessing because I was exposed to Bringing Up Baby and The Philadelphia story at a young age. I'll rarely pass up a Cary Grant film if I see one on or if the opportunity rises (I've seen Arsenic and Old Lace more times than I can remember), so it's weird that one of the best regarded Grant movies went unseen for so long. Thankfully, I rectified that tonight, and I'll tell you, it was time well spent. It's arguably more complicated than just about any screwball comedy I can think of - for a long stretch of the film, you actually forget what Walter Burns (Grant) is really scheming. On the other hand, the Hawks-ian overlapping dialogue is utilized to maximum effect, the jokes come fast and furious, and I found myself caught off guard more than a few times. It's actually the Earl Williams (John Qualen) murder / impending execution subplot that ends up dominating most of His Girl Friday, to the point that Walter's various tricks to keep Hildy and Bruce apart move into the background. Russell and Grant aren't on screen together for most of the film, and it's not until they're both in the same room together that we remember what the whole story is about. Instead, there's a lot of clever business involving why Williams execution has to happen when it does, what political favors the Sheriff (Gene Lockhart) and Mayor (Clarence Kolb) expect as a result. Hildy spends most of the movie in the press room of the courthouse with other reporters. They play poker, torment Molly Malloy (Helen Mack), the "girlfriend" of laid off factory worker turned cop killer Williams, and jockey for position as the story develops. Bruce is often on the outside looking in, due in no small part to Walter using every trick in the book to keep him away from the courthouse, and preferably incarcerated. Let's just say that as a newspaper editor, Burns keeps some dubious company and isn't above breaking the law repeatedly. Then again, neither is Hildy, which is why she can see right through the plans when Bruce and his mother (Alma Kruger) keep winding up in trouble. For such a wild story, His Girl Friday takes some dark turns. Not only is the political corruption tied to race baiting and cop killing, but before the film is out there's an attempted suicide (used to distract characters) and an implied death that sours the mood at a critical point. All while a killer is being hidden in a desk, and not because he didn't kill anybody, but because he's being used as a negotiating point between the press and officials. This is without considering a few casual jokes about Hitler made at a time before most people knew what he was really doing. Still, the use of over-lapping dialogue, something relatively novel for 1940, keeps the pace snappy and provides for plenty of good one liners to sneak in before you've had time to process them. The subplot is interesting and twisty enough that I didn't mind the romance taking a backseat at all - His Girl Friday sets up one kind of story and then nudges it aside in order to tell a more interesting, albeit tangential one. That our leads end up together (and poor Bruce ends up, in all likelihood, still in jail) is icing on the cake. There are two moments where His Girl Friday "winks" at the audience, although one was more clear than the other in 1940. The more obscure of the two is when Burns suggests that the last person to say "that to me was Archie Leach" - Grant's real name. The earlier joke, the one that almost didn't make the movie, is when Burns is trying to describe Bruce to an associate, and in order to convey his blandness, he says "you know, like Ralph Bellamy." It caught me completely unawares, but by all accounts it's the biggest laugh in the film. If you, like the Cap'n, had been meaning to see His Girl Friday and hadn't, give yourself a treat and make some time to watch it soon. It may be nearly 75 years old, but it never feels it. The execution is as fresh today as it was in 1940, and for a movie to last that long, something very right is going on.